Harvesting cherries, growing garlic, gathering carrots and delivering fresh fruits & veggies across the 4,000 square mile area of Latah, Whitman, Nez Perce, and Asotin counties requires a lot of manpower and mileage. Your funds ensure fresh produce will continue to support the 10,000+ community members that rely on the food access sites we serve. We are following Chef Nikki Woodland who has hosted our dinner each year to a new location -- join us at Nectar in Moscow! Though a new locale you can still expect a delightful dining experience filled with locally sourced ingredients and great company. 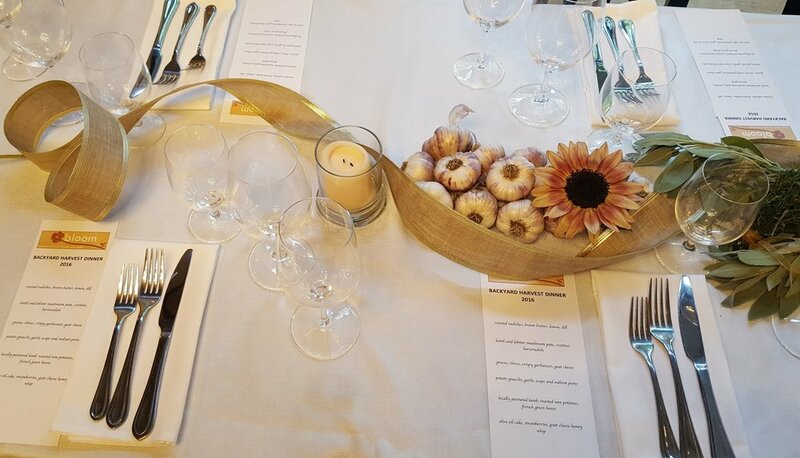 As always, there will be five farm-to-table courses with a specially paired wine for each dish! Come enjoy an evening of local food carefully crafted by Mat Morgan while enjoying the view from the Vista House. This event includes a romantic five-course gourmet dinner farm-to-table style and paired with local Clearwater Canyon Cellars wines. Join us for a good time while we raise vital funds for outgrowing hunger in the LC Valley! We are finishing things off during Hunger Awareness Month with our new Harvest Happy Hour. Let's make new friends, raise some funds, and grow support for getting more fresh foods to our communities across the region! Come enjoy an evening of locally sourced appetizers and delicious wine at Merry Cellars in Pullman! For more information on becoming a business sponsor, contact Executive Director, Misty Amarena.